Green Lantern: New Guardians Vol. 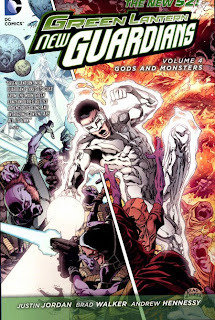 4: Gods and Monsters does double-duty, both serving to introduce the villain du jour of the next big Green Lantern epic, and also presenting the title's new direction under writer Justin Jordan. Unfortunately, the title is only marginally lifted by each, and what has always been a struggling title in the Green Lantern franchise becomes more so with this volume. The pending cancellations of Green Lantern Corps and Red Lanterns might be somewhat surprising, but the cancellation of Green Lantern: New Guardians really is not. A New 52 title starring Kyle Rayner has always been a promising idea; previous writer Tony Bedard's goofy take on Kyle grated, but the teaming up of Geoff Johns's various-hued Lanterns was often a lot of fun. In writer Justin Jordan's new run, the other Lanterns are mostly gone, and Kyle now guides the actual new Guardians of the Universe around the cosmos, ostensibly in a Star Trek-esque "planet of the week"-type title. It's telling that one of the most gripping chapters of Gods and Monsters is the third, which reunites at least Kyle with Star Sapphire Carol Ferris and Blue Lantern Saint Walker. The new, friendly Guardians are a nice change from the old, stale evil Guardians, but they don't drive the title as a compelling supporting cast like New Guardians's old cast did. The first three chapters of Gods and Monsters set-up the "Lights Out" crossover by introducing the crossover's antagonist, the crazed scientist Relic. The first chapter gets there slowly, as Kyle fights a tertiary threat; in the second chapter, Relic holds Kyle prisoner in a fantasy world, and the third is where Relic takes the fight to the Blue Lanterns. To that end, it doesn't feel like the book has much to do until three chapters in. The odd construction of this book includes only New Guardians's tie-in to "Lights Out," the third chapter -- a somewhat tertiary tale where Kyle is again mind-controlled -- and then the fifth chapter Green Lantern Annual conclusion. Though I agree with DC not trying to jam the whole crossover into this book, the result is that for all the work New Guardians does with Relic, it's not coincidentally all catalyst for something that plays out in Green Lantern instead. Jordan offers the first glimpse of what the new New Guardians can be once the "Lights Out" crossover finishes, in the first of Gods and Monsters last three issues. The Guardians bring Kyle and Carol to a seeming utopia, but Kyle discovers that the alien society is using time travel to exchange their own bad decisions for good decisions made in alternate timelines, to their own benefit but to the detriment of those timelines, now dystopias. It is hard science fiction of the kind we don't see that often in comics, and Jordan should be commended. However, the second part swiftly devolves into a series of action sequences, and the art by Brad Walker and Geraldo Borges becomes distorted and indistinct; no sooner has New Guardians shown what it can do than the promise is lost. Gods and Monsters has a curious set of bookends. The first chapter involves Kyle fighting space barbarian Exeter as a prelude to Relic; this struck me as an example of Jordan biding his time to keep pace with the other Green Lantern books, on the reader's dime. I was therefore glad to see Exeter return in the last chapter, and again for the book to explore an alien culture in sci-fi territory. It doesn't immediately seem like Exeter will return that quickly, but I rather wish he would, because the gruff, funny character helps to add to the book the supporting cast it desperately needs. Carol Ferris is present throughout, but Carol's quick shift from romance with Green Lantern Hal Jordan to budding romance with Kyle is nonsensical on one hand and a disservice to Carol on the other. Carol has never fared well as the always-annoyed romantic foil for Hal, and now in Green Lantern Vol. 4: Dark Days, writer Robert Venditti has her break up with Hal because he's too in love with his ring, and then almost immediately she's ring-slinging with Kyle. I welcome Carol being featured prominently in a title (I think Star Sapphire is overdue for her own title, really), but to shunt her from one Lantern's love interest immediately to another's values the character for nothing more than her sexual currency. Unlike Green Lantern and Corps, which will both immediately continue to the "Uprising" crossover, it seems this title gets to tell stories on its own for a trade before it's dragged back into the fold with "Godhead." As we know, again, New Guardians's days are numbered, but I'll be curious to see what Justin Jordan does with that bit of independence. Green Lantern: New Guardians Vol. 4: Gods and Monsters continues a downward trend for the title with only a couple of bright spots within. Next week, we'll finish our Green Lantern Vol. 4 run-through with Red Lanterns, plus Star Trek: Harlan Ellison's The City on the Edge of Forever.